First, it was a United passenger being dragged off a plane. 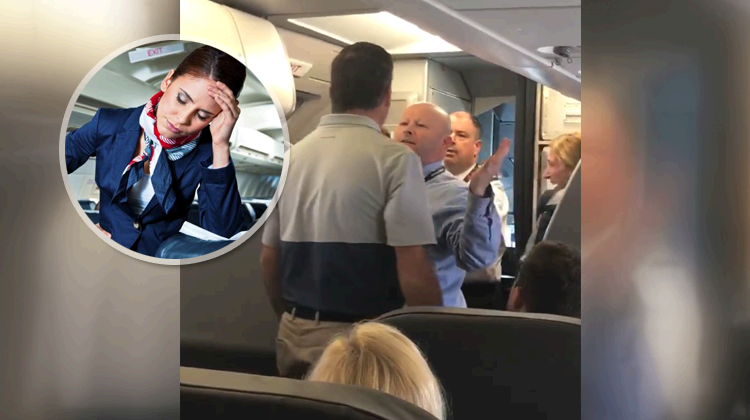 This time, it's American Airlines under scrutiny after a passenger posted a video on Facebook showing an angry confrontation between a passenger and flight attendant. A shocking video has emerged showing an American Airlines employee challenging a passenger to a fight after allegedly hitting a woman with a stroller on a domestic flight. The upsetting footage, filmed before Flight 591 departed from San Francisco on Friday afternoon, shows the airline staff member goading a passenger and saying, 'hit me'. The clip was uploaded by passenger Surain Adyanthaya, who explained he started filming after the flight attendant "violently took a stroller from a lady with her baby on my flight, hitting her and just missing the baby". Adyanthaya went on to explain: "They just involuntarily escorted the mother and her kids off the flight and let the flight attendant back on, who tried to fight other passengers. The mom asked for an apology and the AA official declined," The Daily Mail reports.